When one glances at the 850 Mana you would be forgiven to think that this is an 850 twin, race derived Aprilia, capable of throwing you onto the tar should you make the smallest of errors, however beneath the gorgeous and somewhat intimidating design is a bike that is exceptionally easy to ride and is no more ferocious than your neighbors’ Labrador. However don’t be mistaken, this is not a fong Kong 125cc delivery scooter. In fact the 850 Mana incorporates unique engineering that enhances the riding experience. The 850 Mana does not feature a conventional clutch, instead it features an automatic 7 speed CVT transmission with variable settings that can be adjusted on the fly. Above your right thumb is a mode button that allows you to change the gearbox settings from Rain, Touring or Sport. These different settings dramatically change the bikes personality and power delivery. Because there is no clutch, novices can ride the 850 Mana easily if you treat it the same as a scooter. But due to that thumping twin, power delivery is strong so try to exercise some finesse when opening the taps, unlike that smoky old 125cc 2 stroke though the Mana is also capable of track riding and touring. On your left thumb below the handle bar is a little button for changing up gears when you want and you can also shift down using the button behind the left handlebar. When you come to a stop, the bike automatically engages neutral and when you accelerate, 1st gear is selected, even if you stopped for a split second. An advantage of having the 7 speed transmission is that you have the ability to change gears in the middle of a corner if you are track riding. This is much harder to do with a conventional manual transmission. In sport mode the Mana ensures high RPM by selecting a lower gear for instantaneous power, whilst in touring the revs are kept down and only available when you really need them and in rain mode the Mana allows you to pull off slowly in order to eliminate rear wheel slip. It is ideal to use touring mode as the RPM’s are lowered therefore reducing consumption whilst still providing plentiful power. Like a normal bike, there is also a gear selector for your left foot that you can use, however because it is an electronic selection, the lever does not click, instead it is a smooth movement. So although the Mana features an automatic transmission, Aprilia have ensured the rider with much control over the 7 cogs. This might sound technical but don’t be put off, the Mana is very easy to ride and ergonomically very pleasing. The riding position is comfortable, featuring a soft seat and the handlebars are wide, providing sharp turn in. Also the brakes feature 320mm front discs and a 240mm rear, which is more than adequate. In fact you will find the same Aprilia brakes on the biggest bikes they produce, so stopping power is plentiful. Other features include a handbrake (as the bike is in neutral when off) and a boot where you would expect to find the gas tank. This boot is big enough for a helmet and is an important feature for the commuter market. Also in the boot we find a 12V power socket, ideal for charging mobiles etc, another feature not many bikes posses. The overall ride of the Mana is very forgiving and comfortable, which it should be because of its aim in the market. This is in fact due to the upside down forks and trellis frame chassis. Power delivery is linear smooth and the idiot proof sportgear is an oddity on a bike such as this, but there is definitely a place in the market for it. In fact Aprilia have shown there use for engineering unique and original concepts. 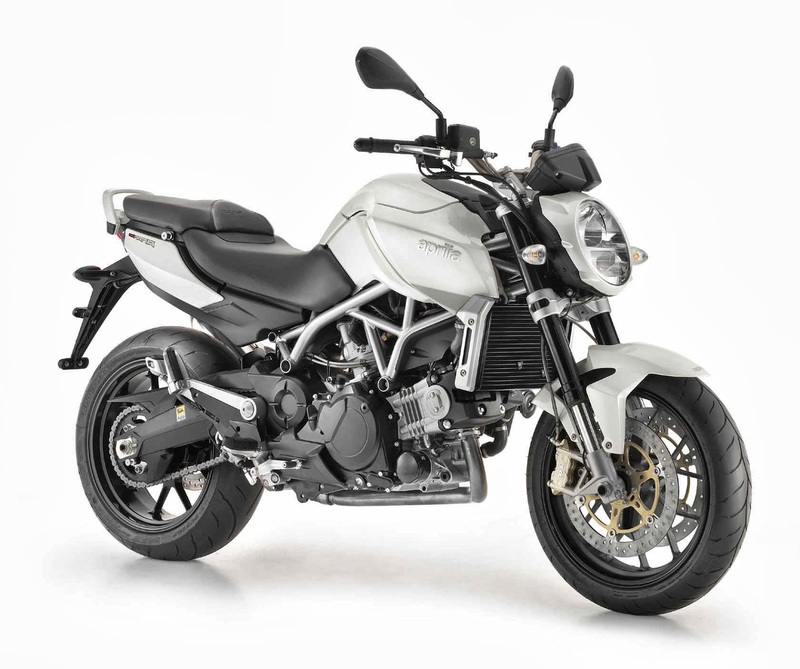 Specifically this bike would be aimed at the person who wants a powerful commuter that also has the capability of touring through the country come Sunday morning. Although the fancy gearbox sounds technical, it makes this bike very easy to handle and very manageable. Don’t be taken in by the menacing looks, the Mana is designed not to be intimidating to ride. If you are tired of riding underpowered scooters and commuters, I highly recommend the Mana 850. The combination between Italian styling and engineering with everyday practicality and ease of use makes it a very rewarding bike. You can buy a new Mana for around R113, 000 and a demo model for around R100, 000. Lean Angle’s motoring article for FTV magazine.